Dale Powers sent this classic photo. This photo is of the 27th Lancers taken in 1973 at the Bluegrass Invitational in Lexington, Ky. 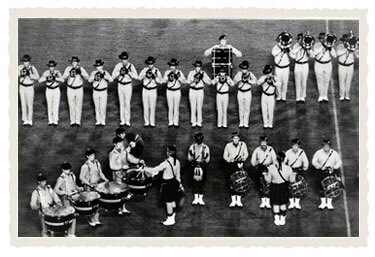 I remember that all the drum corps stayed in the college dorms for two days for that show. Besides always being able to find someone to watch rehearse when we weren't on the practice field, it was great to be able to talk and hang with the people we competed against all the time.